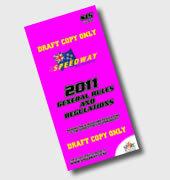 A draft version of the new 2011 Rulebook is now available for download. UPDATE: The full version of the new 2011 SNZ Rulebook is now available. The early release is to assist competitors, tracks and officials with preparations for the new season, and also to have as many people as possible critique the document. Any errors (and there will be some in a book of this size) can still be fixed before the presses start rolling – so please contact us if you find an issue.